I am on vacation in Costa Rica. I sit in the shade on a mountainside patio with a spectacular view of greening hills, the deep blue waters of the Pacific Ocean, and two far-off volcano peaks wreathed in white clouds that lay soft against the crystal blue sky. A gentle breeze whispers through the gardens, while butterflies and hummingbirds dance among the purple/pink/orange blossoms. I breathe in the sweet perfume of jasmine. The air sings with monkey calls, cricket chirps, and the trilling of brightly feathered birds. Hmm. I was on vacation, living in another world, enjoying a moment created purely for my pleasure. This was not Real Life…yet it was real Happiness. And I so appreciated that moment of pleasure, since it was hard earned, just like in real life. In fact, many aspects of our Costa Rican vacation reminded me of the complexities involved in finding Happiness. Needless to say, we got lost. A lot. And isn’t that just like real life? We hear about a “place” to find Happiness, but there are no signs. And even when we think we are following directions well, it turns out that landmarks have changed and we’re back on our own. So there were moments of frustration on the road to Happiness. Fortunately some of the other lessons from our trip more than made up for the uselessness of maps, and I offer them for your journey. No one cares if you don’t speak their language particularly well, as long as you show effort. When you reach out to others you’ll find most people are warm, friendly, and want for you to succeed just as much as you do. Really! The mountain road up Monte Verde is terrible, even by Tico standards. We literally vibrated uphill over 25 treacherous kilometers of cliff-hanging gravel road, around blind curves where the road narrowed to one lane, constantly dodging between huge rocks and craters large enough to swallow us whole. Yikes! At the top we discovered a delightful, ecologically cosmopolitan town filled with friendly people, sitting on the edge of one of the world’s most beautiful and delicate natural wonders: the Monte Verde Cloud Forest. If we’d not been assured by friends that this would be the highlight of our trip (which it was! ), we would have turned around and written off the destination as not worth the hassle. Ever done that in your life? Stopped just short of a goal because the going was rough? And the times you endured… wasn’t the gain usually worth the pain, in the end? Remember that the next time you’re having a rough journey. Nature uses color in powerful ways: to help camouflage, to attract a mate, to lure pollinators… and to provide warning. Both underwater (on our scuba trip) and in the mountainous cloud forest, we saw many, many colorful plants, animals, and insects. I can’t tell you how many times I reached out to a pretty thing and received a “DON’T TOUCH!” signal from my scuba instructor or our rainforest guide. How often are you tempted by how pretty something looks, or how nice it smells… and then you’re terribly disappointed because of how terrible you feel after you buy it, try it, eat it, or indulge it? It’s important to remember that Happiness often shows up in plain moments and simple things – and sometimes in abstinence rather than indulgence. The Tico diet is built on a base of rice, beans, fresh fruit…and plaintains. Lots of plantains. Fried, salted, sautéed, sugared, pureed, and served in countless ways. I overcame an initial aversion to “eating bananas” at every meal and grew to love the myriad ways I could enjoy this versatile, nutritious food. It also took a few days to get used to the open architecture – we slept every night in buildings that were open to the air via partial walls, and louvered windows. Eventually we stopped noticing the geckos and insects INSIDE our rooms and accepted the Tico norm. When things aren’t exactly the way you like them to be, do you turn uptight… or curious? Change is the norm, now and for the rest of your life, and the quicker you can “recalibrate” your expectations, the easier will be your life. Practice this skill by putting yourself into foreign situations and embracing whatever comes – even the sticky-toed lizards crawling on the ceiling! Remember that idyllic scene I described in at the start of this article? I did not mention the swarms of insects and that I sat in the shade because 10 minutes without sunscreen meant a bad burn! No “perfect” situation really is. If you choose to focus only on the imperfection, you’ll never, ever, experience happiness. The sweetest cherry still contains a pit – and so what?! If you’d told me that one of the most glorious moments of my vacation would be getting strapped to a thin cable and pushed off a platform 100 meters above ground to scream across the forest canopy – upside down – I would have said, “no way!” It was WAY cool! It is said, “we only learn when we are uncomfortable.” Think about how true this is for you. We stood on the Continental Divide – on one side of the mountain the sun blazes hot while a warm, dry Caribbean wind screams up the mountain pass across dwarf trees that have evolved to survive the wind. On the Pacific side, that same air becomes suddenly still and drops down the mountainside in clouds of mist that obscure the sun, while the moisture feeds tall rain forests. The climate shift is so severe that many plants/animals that live on one side cannot survive on the other, just a few dozen meters away. How many people stand stubbornly in place and say, “the world is a terrible place” and never turn around to discover that what they really want is just behind them… if they are willing to change their perspective? I am convinced that most of the road system in Costa Rica was designed by sadistic civil engineers with an underlying sense of drama. There are few straight roads; 75% of our travel occurred on roads that bristled with hairpin turns, on the edge of high cliffs, with no guard rails…AND that offered, at every turn, breathtaking views of mountain, valley, water, & sky. Anxiety, fear, and pure terror mixed with curiosity, awe, and wonder. Truly, I believe that the fear of falling off the mountain actually sharpened our senses and increased the Happiness we experienced along the way. If you always live your life in complete safety, you’ll miss out on the view from the edge, which is pretty spectacular. And admit it – sometimes living on “the edge” is the coolest place to be, isn’t it?! In the rainforest we saw trees that were hundreds of years old. Every so often one of those giants, weighed down by age, vines, and parasites, dies and falls to the forest floor. It’s sad to see the huge gash this creates in the forest canopy. But… the event triggers activation of seeds that have lay dormant for years, waiting for some sunlight and rain to hit them directly. New life (what they call “pioneer trees”) grows rapidly into the space, securing the forest floor and prepping the way for a new giant to grow into place over the next hundred years. Sometimes our longest-held beliefs and habits, as lovely and familiar as they are, block the emergence of some other part of us. What if you let go of one or two old thoughts or behaviors? You might be delighted to see what grows up to fill the gap – perhaps a new attitude, a habit, or a new dimension of you, perhaps? As we drove across the countryside, we passed mile after mile of little trees in straight rows, tacked with barbed wire to form fencing. It seemed odd, until we learned what’s really going on. 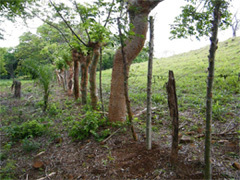 Farmers and ranchers fell trees, cut them into posts, and build their fences. But then it rains for five months…and those seemingly dead logs, sitting in waterlogged soil, put out roots and shoots. For this reason, Costa Rica is called The Land of Living Fences. Trust the Universe to take care of you. Plant yourself in the right environment and you’ll blossom. And you know all that rain falling on your life, right now? Maybe – just maybe – it’s just what you need to support your future growth into Happiness.